Our Interview with Ralph Garman! If you watch Family Guy, you’ve probably heard multiple characters voiced by Ralph Garman. You’ve also might have seen Ralph at Hall H in San Diego Comic Con moderating a panel or you’ve heard him on the KROQ in Los Angeles or with Kevin Smith on the Hollywood Babble-On podcast. Ralph Garman is everywhere! He gave Legion of Sand a few minutes to answer a few questions that we were excited to ask (huge Hollywood Babble-On fans so this was awesome). LoS: First off, did Jordan Hembrough take you up on your Bat collection offer? Will we be seeing you on an episode of Toy Hunter? RG: Jordan and I have connected! We’ve talked over the phone and we’re going to get together when he’s in L.A. later this summer. We’re both very eager to do a vintage 1960’s Batman toy episode of his show, so I think there’s a good chance it’ll happen. LoS: How was it being on the 75 years of Batman panel at Wondercon last month with Jim Lee, Kevin Conroy, Bruce Timm and your pal Kevin Smith? RG: What a blast! I really felt like a rookie around all those Bat-veterans, but, there were great to me. I’m such a fan of everyone on that panel. Even before the panel, when I was doing press with Jim Lee and Kevin Conroy, I think I asked them more questions than the reporters did. LoS: Speaking of Kevin Smith, was the experience of working on ’66 Batman meets Green Hornet mini series with him everything you had hoped it would be? 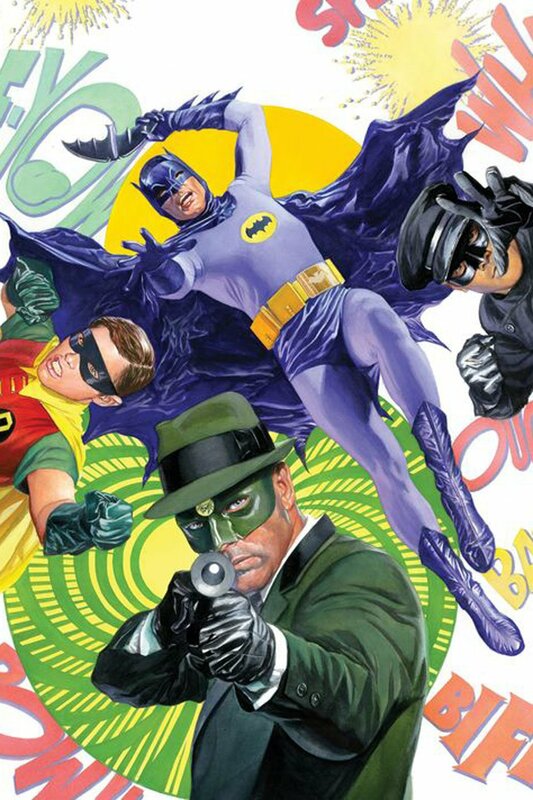 The beautiful Alex Ross cover to Batman meets Green Hornet mini series that Ralph worked on. LoS: You’ve moderated the Dexter panel at San Diego Comic Con for the past several years, with the series having ended, can we still expect a Ralph Garman moderated panel at Comic Con (before Hardwick takes every panel)? RG: Yes, I will be working at SDCC again this year. I used to do DEXTER and all of SONY’s movies, like Amazing Spider-Man, but this year I’ll be presenting the FOX movies. AND, I’ll be hosting a VERY special event that I can’t talk about just yet, but let’s just say it may be the perfect match of project and moderator! LoS: Any listener of Hollywood Babble-On knows one of the highlights of the show is your impersonations, have you ever been recognized in public and they request to hear your Al Pacino or any others? RG: People do occasionally make requests for certain favorite voices that they like from BABBLE-ON, but, more often, they want to do their impressions for me! It’s a little odd. It’s like I’m the V.P of Impersonators and they’re looking for my blessing! lol And, trust me, there are some very talented people out there. I’ve always said most people can do at least ONE impression. LoS: You’re a busy man (Family Guy, movies, HBO, KROQ, con appearances), do you still find time to enjoy a Batman issue or two every now and then? RG: I haven’t had a lot of time to read Batman since New 52, but, I do when I can. I loved the Court of Owls arc! And, or course I read the BATMAN ’66 books. Jeff Parker’s work is so great. One nice by-product of writing BATMAN ’66/GREEN HORNET is that I got to connect with him and tell him what a fan I am. We live in a great time for Batman. There are so many different versions to enjoy! Previous Previous post: Marvel Swag Pack Giveaway!